A crisis is an objective fact to which there can essentially be only two responses. The cause can be identified and addressed, or some other explanation can be advanced which effectively shifts the blame for the crisis elsewhere. The government and the supporters of austerity are increasingly bent on the second course. A succession of scapegoats have been offered for the crisis, including perniciously both immigrants and ‘scroungers’, and now unions. However, as these cannot begin to provide an economic explanation for the crisis, the supporters of austerity also persistently claim that the cause of the current crisis is weak exports, effectively blaming foreigners for the British crisis. The reality is very different. The chart below shows the trend of total domestic expenditure in the course of the present slump. This is the same as GDP minus the changes in both imports and exports. In 2008 and 2009 activity fell sharply and was followed by a mild recovery. But since the Tories began to implement austerity the domestic economy has stagnated. 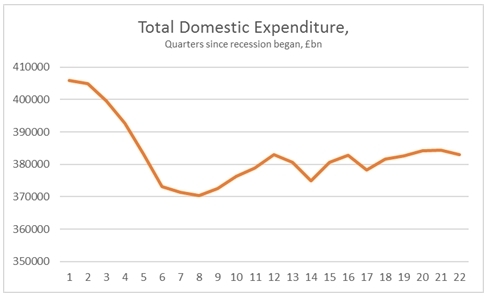 Since the Tory-led Coalition’s Spending Review of 2010 total domestic expenditure has risen by just £864mn. 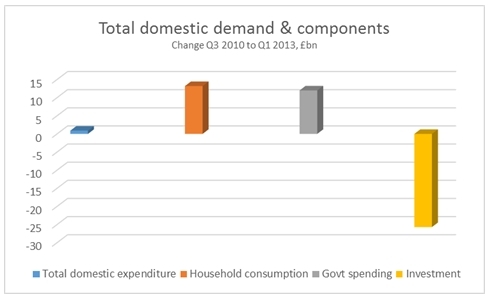 Statistically, in terms of a £1.5 trillion economy, the change in total domestic expenditure has been zero. By contrast, GDP has risen by €21bn since the Spending Review, or 1.1% in over 2 ½ years. This is driven by a rise in net exports. Exports have risen by £18.1bn since the Tory-led government began implementing austerity. But imports have fallen by £3.2bn over the same period. Arithmetically lower imports count as a positive contribution to growth, but they actually reflect the weakness of the domestic economy. These totals are shown in the chart below. 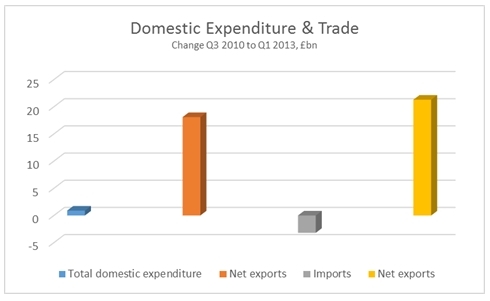 It should be clear that since austerity began the domestic economy has not grown at all while net exports have risen by £21.3bn. It is Britain which is a drag on the world economy not vice versa. In terms of the components of total domestic expenditure, the fall in investment is entirely responsible for the continued stagnation of the economy. Investment (Gross Fixed Capital Formation) is the only category of the national accounts which has fallen over the period from the 3rd quarter of 2010 to the 1st quarter of 2013. Investment has fallen by £25.7bn in that time while government spending has risen by £12bn and household spending has risen by £13.2bn. Far from dealing with the crisis the austerity policy has deepened it. In the preceding slump the decline in investment accounted for most of the fall in GDP, £42bn of a total economic contraction of £45.2bn. Since the imposition of austerity measures investment alone accounts for the slump, as every other component of GDP has risen, government and household spending and net exports. It remains the case that it is private firms which are driving the slump in investment. 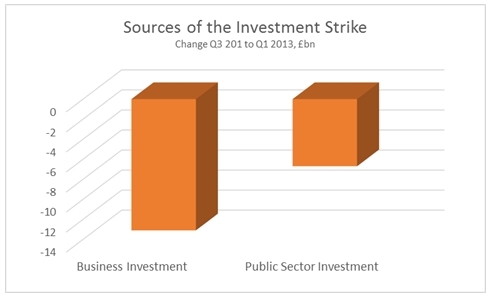 But the government’s austerity policy includes a sharp cut in its own investment, which has exacerbated the slump. Therefore, far from blaming everyone else it is the government’s own policies which have caused the stagnation. The latest scapegoat is the unions, following on from foreigner, immigrants and ‘scroungers’. But it is the austerity policy which has failed. This has clear lessons too for the incoming Labour government. Only a policy which addresses the real source of the crisis – the collapse in investment – can hope to resolve the crisis. Otherwise the danger is that economic policy makers are left casting around for scapegoats to distract from the failure of these policies. This entry was posted in Banking, Economics, Finance, Party Organisation, Policy Documentation, Topical News, Unions and Political Activism and tagged austerity, humanity, finance, spending review by adminthinkleft. Bookmark the permalink. It wisnae me, it wiz aw,body else! Don’t forget the elderly and the disabled, especially if they are an immigrant,in a union or unemployed. Who cares what the Tories are saying what worries me more is on the whole Labour agrees with the Tories. Grass roots Labour certainly don’t think that, I am one of them ,… and I don’t believe the Leadership does, but what is the biggest concern is that the PLP still has a large contingent of Blairites on the right. An SDP-like floor crossing at this point would be a disaster, in my opinion, if the priority is to remove an extreme right wing coalition. But what Miliband needs is encouragement and courage to set out a left wing agenda including rail nationalisation. The toxic press and Tory lies, are nothing new and also have to be manoeuvred. We need a Labour government to be elected. No other party can achieve removal of this awful, awful government. But it won’t be New Labour. Never again. The Left must be united…. Else divided we fall.